I am not a runner. You may mistake me for one, however. It might be because I run five days a week. Or it could be because I own a treadmill. You are probably confused because I have a running coach. It also doesn’t make sense as I have friends in the running community and I am a part of running groups. But, I am NOT a runner. I’m a hiker; a hiker who has tapped into running to help better prepare myself for my Appalachian Trail thru-hike. If you recall my previous post, I detailed my “failed” section hike of the AT. I learned a lot of tough lessons on that trip. One of the takeaways was that I was ill-prepared for uphill walking. My legs were simply not acclimated to walking on an incline. Further, my cardiovascular strength left much to be desired. After that first section hike, I knew I needed to strengthen my legs as well as build my endurance. I decided running was the way to go. It began with the Couch to 5k app. A couple of mornings a week I would go for a 20- to 30-minute jog. As the weeks passed, I ran faster and faster. Don’t mistake that I could run fast; I simply mean that I made improvements. Fast forward a couple of months and I had plateaued. I didn’t know it then, but, I would stay stuck in the same running pattern for years. Do you know why? Because I’m not a runner. Therefore, I did not know how to push through the plateau to make further improvement. 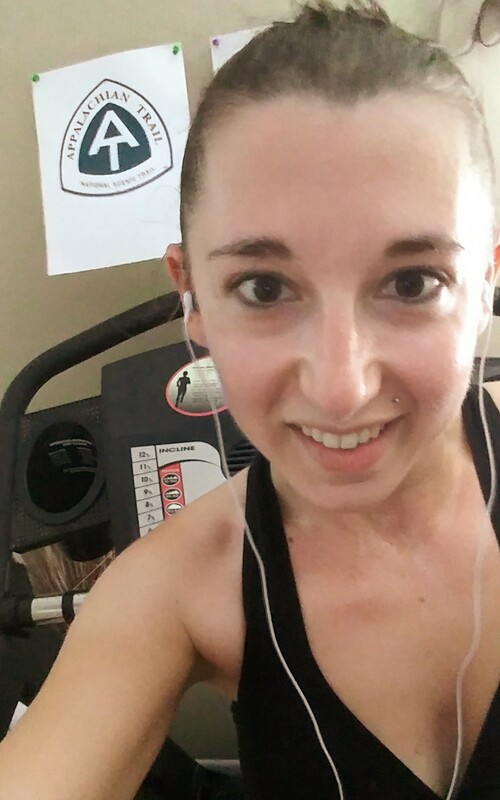 Hitting the treadmill with the AT as my motivation. Then I met Mike and things changed. You’ll get to meet Mike too because he’s a SOBO Trek blogger. I hope you find him as inspirational as I have. Mike is a self-motivated guy who lost over 100 pounds by changing his diet to keto and incorporating running into his regular routine. Unlike me, Mike IS a runner. Do you know what happens when you befriend a runner? They make you run with them! It was just the accountability I needed and the motivation to push myself that I had been lacking. Running with Mike was terrible. He’s a lot faster than I am. Hard as I tried to keep up, I often felt like I was dying after our runs. It was starting to beat me down. Mike and me before the race. Enter Holly, the running coach. After my boss had a serious bicycle accident, he switched from cycling to running and had employed the help of a running coach. Watching my 50-year-old boss run longer and faster than me really opened my eyes to how helpful a running coach could be. So I gave Holly a call and we started working together to improve my cardio strength and endurance. In just a matter of weeks I was running five, six, seven miles at a time. My speed had improved too. 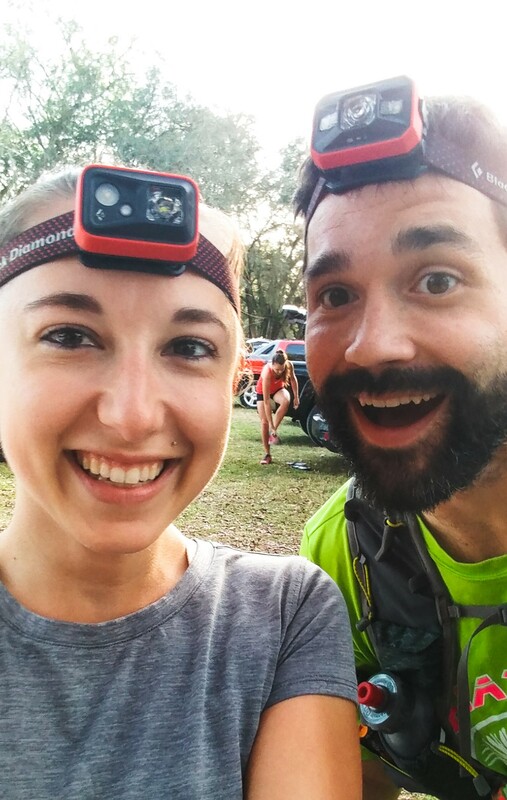 Then in January, Mike pitched to me this insane idea that I participate in the Skunk Ape nighttime 30K trail race. To this point, my longest run was eight miles. I had never run on a trail before, let alone run anything in the dark. 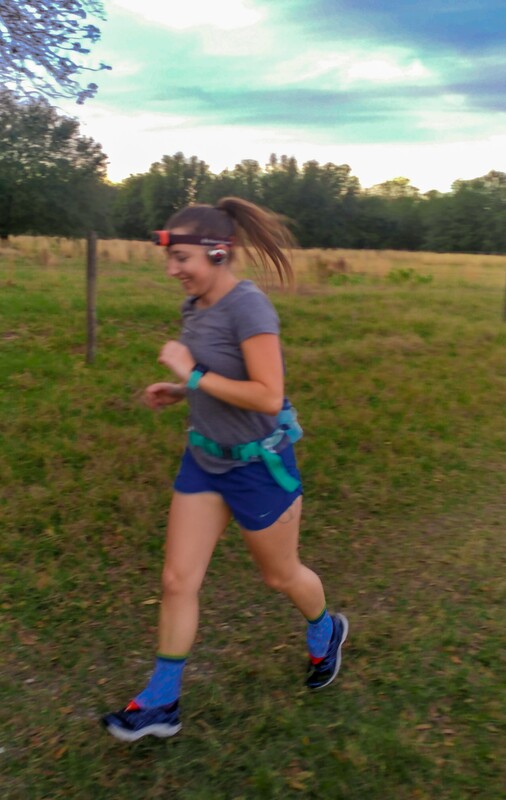 How could I possibly run 18.6 miles, on a trail, in the dark with no experience? I immediately declined. I felt like such a suggestion was a setup for failure. While I was open to the idea of running a race, even though I’m not a runner, I would think it more realistic to attempt something like a 5k or a 10k. Mike’s response to my “realistic approach” was to point out that hiking 2,200 miles was just as crazy an idea as running a 30K. How did I think I could hike that far if I didn’t think I could run for 18.6 miles? He said running a 30K is a mental game more than a physical challenge, much like hiking 2,200 miles would be. As an ultramarathon runner, Mike might know a thing or two about mental games when it comes to running but how could he compare a trail race to hiking the Appalachian Trail? They’re kind of different. I really struggled with Mike’s philosophy that running nearly 19 miles would somehow help train me mentally for my thru-hike. What really happened when he presented this idea to me was that I began to question my ability to successfully thru-hike. I slipped into a brief depression. I didn’t talk about hiking for several days. I lost all motivation to train and I found myself stuck in my head. My self-talk during this time was very negative. I kept telling myself that I couldn’t do the AT, that while I may be physically strong enough, mentally, I was too weak to ever be successful. I was pretty sure it wasn’t worth even trying. I resided to myself that I was a failure. Thank the hiking gods, my desire to hike the Appalachian Trail won over my negative self talk! After a few days of contemplation and repeating the same lie over and over to myself, that I cannot possibly handle the mental game that is the Appalachian Trail, I bounced back. This process in and of itself was great practice for my mental muscle. As I returned from my mini depression, I reminded myself of the lengths I had gone to in order to ensure my thru-hike’s success. There wasn’t anything I wouldn’t try in an effort to better prepare for such a serious undertaking. That said, I was still skeptical of Mike’s idea that running the race would somehow help me mentally. Further, I still had my doubts that I could even run for that long. So, I called Holly and asked for her input. Surely she would agree that running a 30K was crazy. To my surprise, however, Holly thought it was the exact thing I needed. She pointed out that if I can carry a 30-pound backpack and walk 20+ miles in a day that it is not a big jump to carry the weight of my hydration belt and move a little faster. To Holly, a 30K was not only realistic given my fitness level but advisable because I DIDN’T think I could do it. How else will I ever know I am capable if I don’t at least try? With Holly’s approval and Mike’s encouragement, I signed up for the race just two days before it was to take place. All smiles as I began the race. On Feb. 10, 2019 I ran 18.6 miles, in the dark, on a trail. I couldn’t believe it! 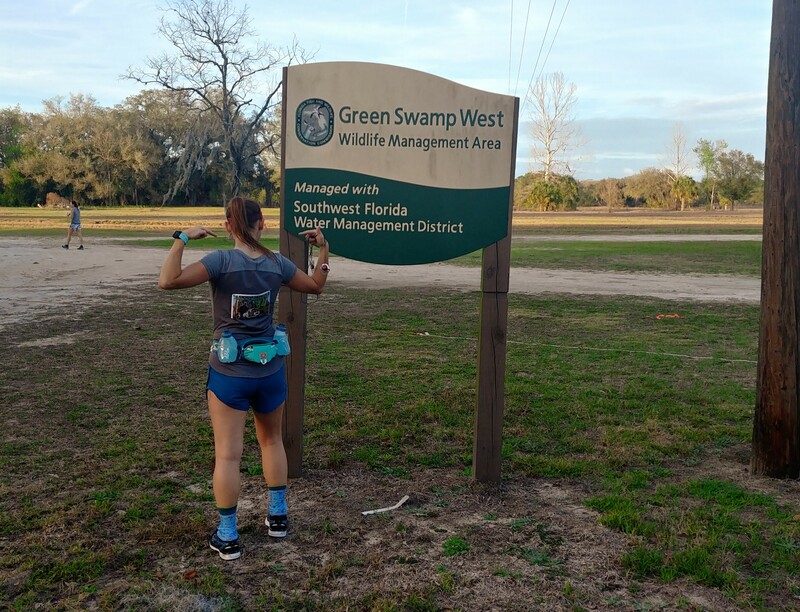 With nothing more than a headlamp, a hydration belt, and an open mind, I did the very thing I previously believed I could not do. I kept a positive attitude. This is exactly how I will complete my thru-hike of the Appalachian Trail. Feature image courtesy of Joseph Fuller.